Well as you can tell by the title of my post, I am now a member of the Through The Craft Room Door Design Team. I am excited for this amazing opportunity. Please join me as I design and create new projects that I hope will inspire you. I would like to welcome everyone to Though The Craft Room Door challenge, the challenge is always “anything goes”. We would love for you to join us. The current challenge begins today, Nov. 4th and ends Nov 10th. We also have for viewing in the Subscribers Only Area" at Through The Craft Room Door our magazine website. It is loaded with paper craft tutorials, tons of inspirations and projects you can create. Our magazine comes out 5 times a year and cost $18.00. Lots of freebies as well! Sandi Huggett is this month's Featured Digi Artist She has given us some wonderful images for you to download. Anne Fenton has also given us three sweet holiday digi images to download as well. We also have some yummy Holiday recipes! Come on over and join us! The Design Team and myself look forward to seeing you there. For my first project as a DT member, I used a digital stamp from That Craft Place, this week's sponsor. She was really fun to color! Image: The Craft Place- "Betty Boots"
Tape the ribbon to the background paper prior to adhering the paper to the card. This will create a clean look on the inside of the card. Put a brad through the flowers. Ink the edges of the white flowers to add a pop of color to the flowers. Poke a hole in the card to attach the flowers. I hope you enjoyed my first post as a DT member of Through the Craft Room Door. I encourage you to head over to our blog to see what all the other DT members have created for you today. These cards will inspire you. While you are there consider joining our challenge. This week's prize is three images from That Craft Place! Click HERE now! 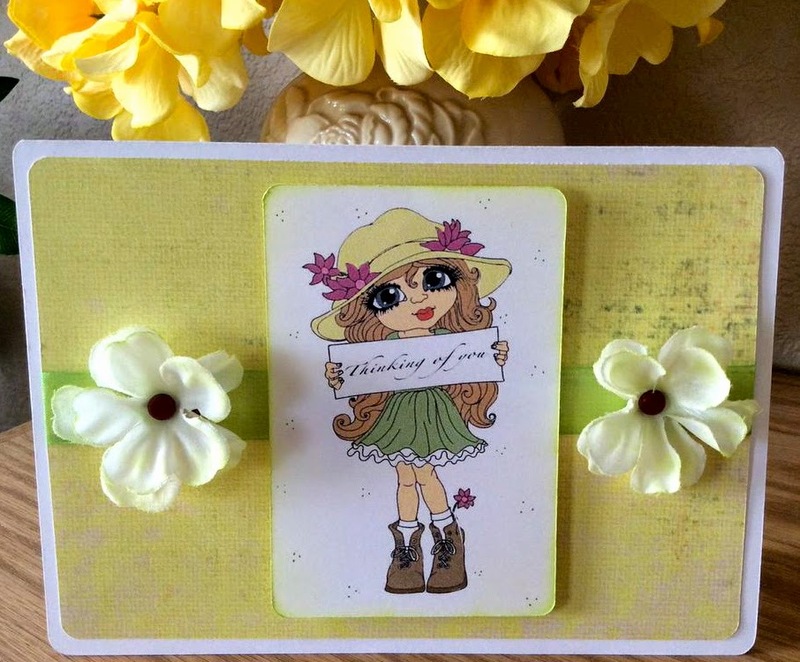 This card is too cute and perfect for our DT call over at Crafty Gals Corner. Thank You for joining us last week at AI! Hope you will join us again!